Auto ​hoists come in a variety of styles, but most of them can be divided into one of two categories based on how they engage the vehicle: wheel engaging car hoists and frame engaging style car ​hoists. By far the most common auto ​hoists from each category are four-post ​hoists (wheel engaging) and two-post ​hoists (frame engaging). Less common car hosits are known as specialty lifts and include scissor lifts, portable lifts, mobile column lifts, in-ground lifts and parking lifts. Here's a quick breakdown of each type of auto hoist and what it can do for your home or business. Four-post automotive ​​hoists offer owners a lot of versatility when it comes to heavy lifting. In general, four-post car ​hoists can hold higher capacities compared to two-post hoists because of the additional support columns. They are also very user-friendly due to the drive-on and park method of mounting that is typical for wheel engaging hoists. Many quick-lube stations and muffler shops prefer a four-post car hoist over any other kind of auto hoist. A four-post car hoist is also particularly popular among hobbyists and home-users for home garage parking because it usually doesn't require any sort of floor anchor. Smaller capacity four-post hoists can even become portable with the addition of an optional caster package. Thanks to the solid four-column design, four-post auto hoists are also ideal for storing two vehicles when only one space is available. On the flip side, all the additional building material in the construction means that four-post auto hoists are usually a bit pricier than their two-post brethren. And if you plan to use your four-post automotive hoist for wheel service, you will probably want to invest in rolling or sliding bridge jacks to lift the wheels off the runway. However, for capacity, mobility and storage in your car lifting solution, you can’t do better than a four-post car hoist. Two-post car hoists are the most common type of frame-engaging auto hoists that you’re likely to find in a professional automotive shop. With two incredibly sturdy posts and supportive stabilization arms, two-post car hoists are capable of holding a large variety of vehicles at a height that’s comfortable for both the automotive technician and the DIY’er. However, the best reasons to own a two-post car hoist are the reduced price compared to four-post car lifting options, the small horizontal footprint for space saving convenience and the complete, unobstructed access to the wheels. Two-post auto hoists are either considered symmetrical or asymmetrical. Symmetrical automobile hoists are easy to identify because the posts face each other dead-on, and the support arm assemblies each hold approximately 50% of the load. Asymmetrical automotive hoists, on the other hand, feature swing arms that are not the same length in the front and back, as well as a rotated post design. The result of these two features is a shifted center of gravity (which is greatly beneficial to longer, unbalanced trucks) and better clearance for vehicle doors, giving the operator direct access to the automobile interior even when the car or truck is raised. Both asymmetrical and symmetrical two-post garage hoists work fine with lighter vehicles, so the distinctions are mostly moot unless you are going to specialize in heavier, unbalanced vehicles. 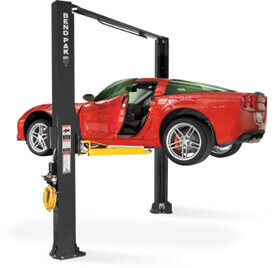 Two-post car hoists are not very common in residential garages because they are much taller than other automotive lifting options, require more attention to detail to reach designated vehicle lifting points and don’t grant the vehicle stacking convenience found on four-post garage​ hoists. In most cases, a two-post car or truck​ hoist is most beneficial to garages that see cars and trucks going up and down all day long. Scissor lift is a broad term that encompasses all car​ hoists that raise their payloads with accordion-like mechanisms beneath the runways. Depending on the configuration of the cylinders and raising rods, a scissor lift can be described as “X” type, parallelogram type or pantograph type. Scissor auto lifts come in a very wide range of capacities and heights to benefit both professional shops and home hobbyists. Low-rise car lifts raise up to 36-inches above the ground, mid-rise auto lifts raise between 36 inches and 48 inches and full-rise scissor lifts can go anywhere above that. However, scissor car lifts increase in size immensely in higher weight categories. Parallelogram style scissor lifts in particular are known to be some of the heaviest lifters on the market. Scissor car lifts can fall into either the wheel engaging or frame engaging categories. Thanks to the low-profile, vehicle mounting is generally a hassle-free operation. Little is required beyond positioning the car or truck over the scissor lift. Some slight tweaking may be necessary for frame-engaging style scissor lifts. When not in use, scissor style car lifts retract into a low profile. This is ideal if you are a home user and want to be able to park your vehicle over the car lift when its lifting functions are not required. However, scissor style lifts never disappear completely unless installed below the floor and cannot be used to stack two vehicles in one slot. Also, because the raising mechanisms are directly below the runways, it’s impossible to stand directly beneath the vehicle. Nonetheless, scissor lifts are a popular choice among home users and professional users alike and are worth your consideration. If you don’t have much room in your garage or shop, space may be your primary concern when considering an automotive lift. 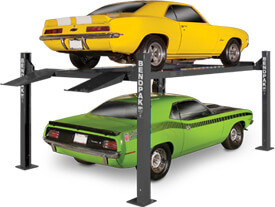 In recent years, portable car lifts have become a viable option for those with limited space who still want to get the most out of their garage or bay. While lower capacity four-post lifts on casters can often serve as a portable car lift, more specialized solutions include mobile scissor style lifts, portable single post lifts and the QuickJack portable car lift. When it comes to portable car lifts, always be aware that you trade function for form with these smaller portable car lifts. You will be unable to lift larger, heavier vehicles. Always make sure that the car lift you’re considering can handle the appropriate capacity for the vehicles you plan on lifting before looking at overall footprint. Another space-saving option to think about is an in-ground lifting solution, which is covered in the next section. For a long time, in-ground car hoists were considered the car and truck lifting standard for larger shops and rental businesses. The most attractive feature is the ability to keep your car hoist hidden within the floor of your shop or garage when it is not in service. These auto hoists can be either elevator style or scissor lift style and are good choices for keeping the ground clear of clutter. Like scissor lifts, in-ground style car hoists can also be frame engaging or wheel engaging, depending on the design. The added space comes at a cost, however, and in-ground hoists can be about double the price of a similar capacity two-post lifting solution. Added expenses can include cutting up and preparing the concrete for the car hoist’s body, which can a sizeable investment in itself. In the past, in-ground hoists have earned a bad reputation for being harmful to the environment and prone to leaks. When oil leaks from the car hoist, it can seep into ground water reservoirs and contaminate the water supply. Due to the tidy manner in which an in-ground lift is stored, it's very difficult to detect an oil leak. The EPA has mandated leak safeguards around all installed in-ground hoists. In-ground hoists are the only automotive hoists that require this oil barrier and it adds considerably to the overall cost of ownership. The good news is that in recent years, environmentally safe in-ground lifting solutions have hit the market and sidestep the leakage problem completely with non-toxic hydraulic fluid. Alignment auto lifts are special class of lifting solution because they come with extra features to make it easier to perform alignment service on cars or trucks. Although alignment lifts were originally designed for automotive repair shops, dedicated hobbyists can also utilize the alignment function of these lifts. 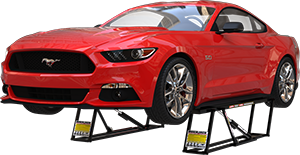 Alignment car lifts can be any kind of the previously discussed wheel engaging auto hoists (four-post hoists, scissor lifts and in-ground hoists) as long as the car or truck tires are resting on some sort of a runway. Special turn plates and slip plates are built right into the runways, so the wheels can easily turn without resistance. For that reason, mobile column that hold each wheel in their arm assemblies cannot be alignment lifts. The concept is simple: if you need to lift something very large and very heavy, just add more posts! Mobile column car lifts give you the flexibility to add or subtract heavy-duty posts as needed for specific lifting projects. Advanced models even come with wireless communication features that allow one operator to simultaneously lift the platforms of up to eight independent post structures. 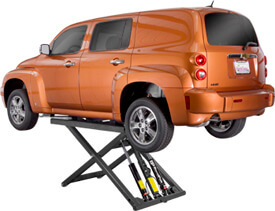 Mobile column car lifts are currently wheel engaging, but use lifting forks instead of runways to engage the car or truck. Due to size, price and capacity, it’s very unlikely that a home user would ever require a set of mobile columns. Both public parking structures and private garages can benefit from parking lifts. Generally, parking lifts feature footprints slightly smaller than four-post car hoists, but the concept remains largely the same. 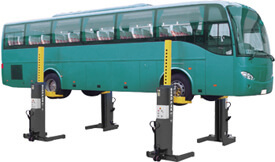 The lifting platform is supported by either a single post or two posts and is designed so that another car or truck can be parked beneath it. Effectively, a single parking slot can do the job of two with a parking lift as a home garage parking solution or a public garage parking solution. 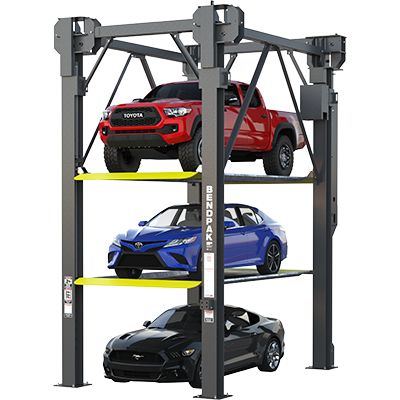 Parking lifts feature a full drive-on deck instead of two runways, so automotive service, maintenance and repair is not a viable option for this type of car hoist. Exclusively a wheel engaging lifting method, parking lifts are meant only to be used for parking. As you can see, there are a lot of different benefits to consider when buying a car hoist. Knowing your space restraints, vehicle dimensions and setting a budget for yourself will go a long way towards helping you decide which auto hoist style is right for you. Next, we’re going to talk about safety. After all, cars and trucks are really heavy--if you’re working beneath a vehicle, you better be able to trust the automotive hoist it’s resting on.